I’ve been running a few reference articles this month as news is thin on the ground, sharing some tips which new readers might not know about. One of those ‘things you didn’t know you didn’t know’ is that it is possible to earn British Airways Avios points and tier points when flying with Emirates. Emirates is an excellent choice for long-haul travel, especially in premium cabins on the A380 routes and especially if you live in the regions and would otherwise need to connect at Heathrow. Here is my review of Emirates A380 First Class and here is my review of Emirates A380 Business Class. Qantas signed a major tie-up with Emirates four years ago. A large number of Emirates flights now carry Qantas flight codes. Qantas is also a member of the oneworld alliance alongside British Airways. New Club World food service photos .... with Bollinger?! I tried to do the Qantas/Emirates thing for flights to Tokyo a couple of months ago and it seemed like it wasn’t possible. Rob’s comment that it works for most places in Asia has me wondering if I did something wrong – anyone able to confirm either way? I think the code-sharing opportunities depend on where the journey starts. I recently needed to book an EK single from DXB to BEY and, aware of this opportunity, failed then to find anyone that could book it as a QF codeshare (tried Qantas direct, Expedia and numerous others online plus called Amex Travel). If however starting your journey from Australia (or perhaps just not DXB?) you can find the same flight as an onward connection as a QF codeshare. I wondered if this was the expected result or I just needed to try harder! YES flew DXB-BNE on QF codeshare, TPs and avios credited within 6 days. Did you follow as per Robs guide above? I like the fact you can book hotels with Skywards miles – even with low amount of miles (~16,000), I was able to book a Holiday Inn Express. So I’m assuming that once you have a ready made the booking on an EK flight number that you cannot change it to a QF flight number post booking? Is the best option then to change the frequent flyer number to an Alaskan number or to accumulate emirates skywards points? Depends how many you are going to earn and whether you have an Amex Membership Rewards account which could top up the Skywards account. If you would get to 6,000 Skywards then crediting to Emirates and emptying out for a £20 Heathrow Rewards voucher is probably the cleanest route. Is there any way at all to transfer Emirates Skywards point OUT of their scheme? Isn’t Heathrow Rewards considered the best route for this? To spend on duty free. I think was 6000 skywards = £20 voucher? Arsenal is the best way! …unless you are a stoke fan (and I am not!). I opted for the Box tickets for the Brighton match, then discovered that it is a 12 noon start, which could be challenging. I asked if I could cancel and they said no and no cooling off period. I’ll see you there then … probably with my daughter. There was an article on this literally yesterday! I haven’t done the arsenal redemption but in my opinion is not good value compared to a normal ticket. There are normal tickets available for most games if you know where to look. Really? Standard tickets for the game I’m going to are 12,500 Emirates miles. That is £40 of Heathrow Rewards vouchers. As these will be the best standard seats in the ground, I’m pretty sure you can’t buy them for £40. The box seats are 20,000 miles which would only get you £60 of Heathrow shopping vouchers if you converted that way and I’m pretty sure you can’t get a fully caterered box seat – yet alone in the best positioned box in the ground – for £60 …. Well I wouldn’t consider a £40 voucher to be good use of 12500 miles either! But if it was a choice between the two options then clearly Arsenal tickets would be preferable. But unless you’re going on your own you’d need at least 25,000 miles – for those with modest points balances perhaps these could be used for a flight instead. Then there is the box Vs crowd argument – give me the crowd any day which IIRC the cheapest is about £26 at Arsenal. I know we’ll have to agree to disagree on the last point – unless you, me and Jordan D care to ponder that with the hoi polloi at the Twelve Pins or similar before your game?? Interesting, but whenever I come across a QF flight number how can I check whether this is a Quantas plane or a Emirates plane? I thought if it says ‘operated by quantas’ it meant a Quantas plane? The easiest way to check would be to search for the flight number/details on the Qantas or Emirates website. BA will say “operated by Qantas” on their website regardless of it being Emirates or Qantas metal as Emirates isn’t OW & BA have no partnership with EK. Emirates or Qantas (or indeed Expedia) will show the correct operator. I think all 4 digit Qantas flight numbers starting with 8 are code share flights operated by Emirates. Drop the 8 and you get the Emirates flight number. Eg. QF8406 is actually EK406 (DXB – MEL). 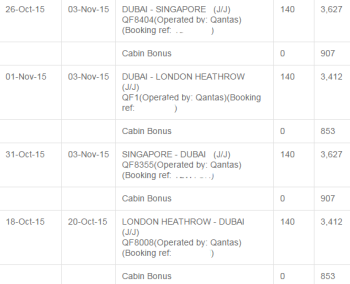 I have some Qantas flights to DXB coming up next week. Both legs booked as QF flight numbers, though the return is operated by Emirates. As a BA Gold/OneWorld Emerald – does anyone have any ideas what I can expect on the return flight, in terms of OneWorld privileges? Do Emirates honour any of them at all? Can I use business check-in, choose seats, etc..? Flew out to Australia with my husband via Dubai and I am OW Emerald/BA gold. We had a 5 day stopover in Dubai since my in-laws live there, but overall I’d take QR J class since the flights cost less for the same amount of tier points, service is excellent and you get the perks including the wonderful Al Mourjan lounge in Doha. Does anyone know if you still get the car with Emirates operated flights in first class when booking with Qantas flight numbers?? Im 2016 I flew to Dubai return,on a QF flight code. The LHR to Dubai was Emirates metal, and the return flight Qantas metal. I received tier and avios points for both flights. In regards to other benefits, it was less than straightforward. 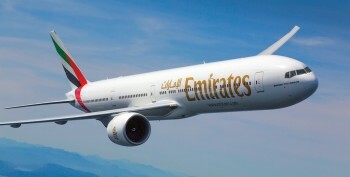 if Emirates metal, your oneworld benefits, such as lounge access, priority check in etc. are not recognised by emirates, despite being a QF code. They treated us like something they had stepped in, nasty. I could not access Emirates lounge. In T3 i just went to BA lounge, who saw a QF code and let me in. The return from Dubai, same issue, but after speaking eventually to a Qantas person, and after much berating Emirates standards, lower than QF, i was able to check in and was granted lounge access as flying on QF metal to London. If it had been Emirates metal, no access. Therefore on my next trip, i will try to fly QF metal, at least as far as Dubai. This was for an economy ticket, so if flying Business some issues will go away. not sure why you expect emirates to honour one world status just because of their JV with Qantas. Perfectly reasonable for them not to. Yes – this isn’t specific to BA, just a function of using the QF code. For those travelling in economy you also need to be aware that on Qantas Metal flights you have to pay to pre-choose your seats but on Emirates you don’t. At £30 (IIRC) a segment from Man-Mel it’s not cheap. It was a domestic RFS booking – seems a common problem looking at the “ba.com: technical issues tracker” thread on flyertalk. I shall call. Crediting a Virgin America First flight (Booked from Alaska site) credited to Alaska or to British Airways? Which UK supermarkets are the easiest to accumulate gift cards / vouchers to bring forward some future spending to ensure they can hit the target ? Also does anyone know which, if any, French supermarkets accept Amex ? Tesco if you have any £x off £y spend vouchers. Non-tesco gift cards qualify for the discount. Morrisons used to offer some ‘More’ points when buying GCs, not sure if they still do. Otherwise it’s probably just a case of which retailers sell the brands you want to stock up on. If you want to keep your options open then you could buy Tesco gift cards now, then at a later stage use those to buy branded gift cards from Tesco for stores you want to use. …or you could use Amex via PayPal to buy Zeek credit and then convert into discount branded gift cards which would get you a better price if you’re interested in saving a few quid. Morrison’s still give extra points on GC equivalent to 2.5% in vouchers, which you can use to buy more GC. Carrefour are a huge French supermarket chain and in Spain (where I shop) they take amex..
Also Geant Casino… I used Amex at a couple of their hypermarkets last month. Many major supermarkets take Amex in France, we use our Lloyd avios Amex everywhere there, even some restaurants accept it. Petrol stations no. But he would be paying the forex fee every time. Depends how quickly he wants to make his target. Are you a named 2nd cardholder. You could do the spend for him here in the uk tho. Yes, advance gift card spend is the way to go. You could simply top up your Amazon account, if you shop there. You then have ten years to spend the whole amount. I can confirm that this also worked for me multiple times. However, on one trip booked in business I used the Emirates First Lounge as I was EK Platinum at the time. I didn’t notice but when I handed over my card my Emirates number was entered into the booking replacing my BA number. It was only when the flights got credited to Emirates that I realised what had happened. I asked Emirates to reverse this and they refused but suggested I contact BA. I filled out a missing miles and tier points form and to my surprise they were credited very quickly and to my even bigger surprise the Emirates miles were not reversed. I’d not recommend this as a reliable process but might work for you in similar situations.